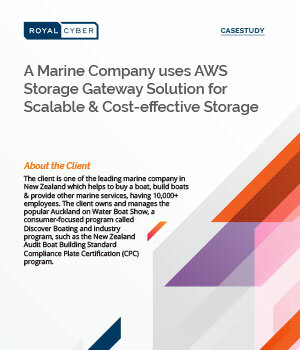 Introduction: The client is a leader in the marine industry needed help to preserve data on distinct location like the AWS cloud to configure where the HA & data retention so that data will be available in case of primary storage down. Challenges: Backing up sensitive data to local storage in their on-premises data center, the client didn’t have a secondary storage solution to house the data for extended periods of time and to get a professional DR. Solution: After the assessment and implementation process, a solution leveraging AWS Storage Gateway helped the customer reduce overall storage cost while easy to manage, deploy and provision on the AWS cloud with no upfront commitment and price.